Looking for something to do with mom for Mother’s Day? Join us for our make-and-take Succulent Planting! No registration or tickets needed. Treat the mother in your life to a beautiful brunch with unlimited mimosas. Kick off the summer with this enjoyable and unique 5k/10k/0k that takes you around the vineyards of Carlos Creek Winery and through beautiful lakes country! A BIG day of celebration & wine! An event for the whole family! Join us for this fall inspired wine & paint class. Enjoy beautifully paired wine and food courses in our intimate setting with the people you love! A Murder Mystery Dinner including a 4-course meal and the show! Your destination wedding planning event in the Minnesota Lakes Area! Great deals shipped right to your door! Deals are online only! Join us for a fun day of shopping, deals, wine & more - deals are in-store only! Join us the first Sunday of every month November-April to discuss great books and drink great wine! A formal evening of dancing, food & drinks. Wear your best mask and dawn your best dress & suit. Our 10th Annual Applefest including many FREE activities for kids and the whole family to enjoy! 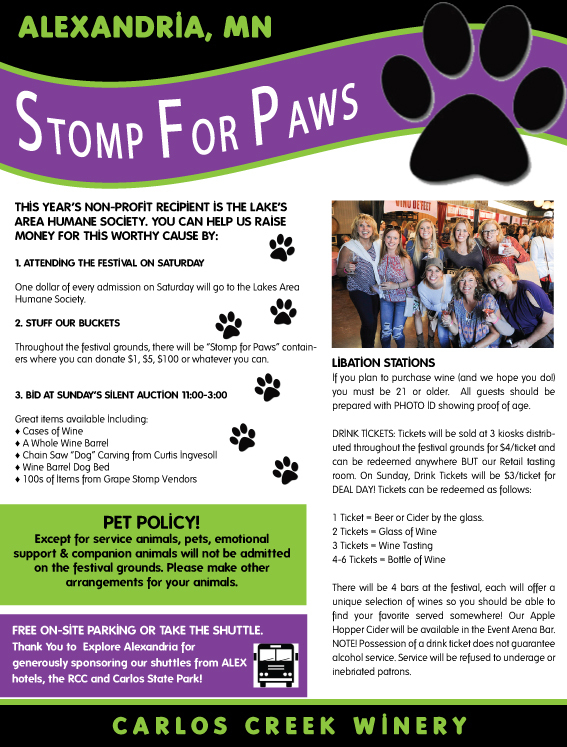 Click here to go to our Grape Stomp website for more information! Join us for Music, Yoga, Bonfire & Great Drinks! The Killer Vees - SOLD OUT! Rock N’ Roll at the Winery! Pamper the Mom in your Life! Join us as we explore the art of RAKU firing! Pick out your own pre-made pottery piece - handmade by Bill & Mimi Seykora - glaze it (with assitance from Bill & Mimi) and watch the magic as we fire it right before your eyes. Learn and create all in one day! - a great activity to enjoy with friends and family. Keep your creation or give it as a gift! 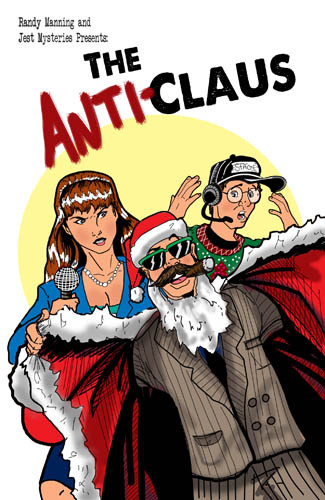 MURDER MYSTERY DINNER - "THE ANTI-CLAUS"
Welcome to the Judy St Judy television talk show! It’s the only daytime show that really gives Jerry Springer a run for his money! All kinds of non-functioning family skeletons will be brought out of the closet, but the big news is that Judy St Judy has scored a huge guest! That’s right! The jolly old elf himself, Santa Claus, will make a guest appearance on tonight’s show! Why? Because this Judy’s holiday show, “The Judy St Judy …Making Christmas Special” Special. Hope everything goes right. I know that Judy can be a little stressed out from time to time and when that happens… it can get a little crazy!!!!! MURDER MYSTERY DINNER - "COMIC BOOK KILLER"
In a world where Super Heroes and Super Villians clash….there’s no room for trouble. But that’s exactly what the evil Doctor Weevil is. Trouble! He’s out to cause problems any way he can! He proves that there is no honor among thieves because he’s out to destroy both good and bad guys! But wait! Someone stops him! Who could it be? Experience harvest season on the vineyard! Learn how to hand harvest grapes and experience the work that goes in to each bottle of wine! Work with CCW staff who will share their knowledge of grape growing and wine. Receive a FREE "Harvest Help" sweatshirt and a bottle of wine of your choice! !